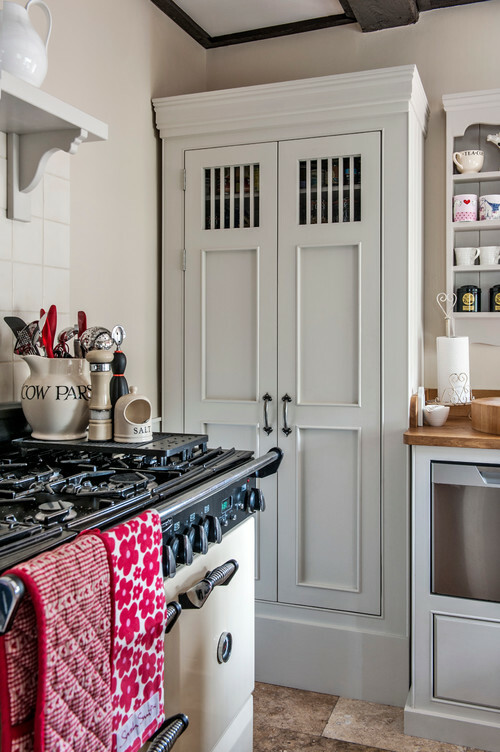 Do you struggle with storage and space issues in your kitchen? I think most people do, regardless of the size of their kitchen. 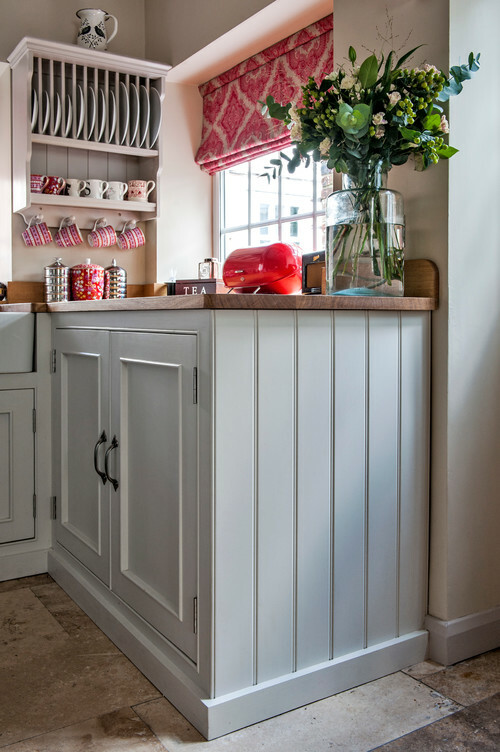 Today I’m featuring an adorable, small space kitchen that’s large on style and storage. When I discovered it, I was amazed at the smart use of space! 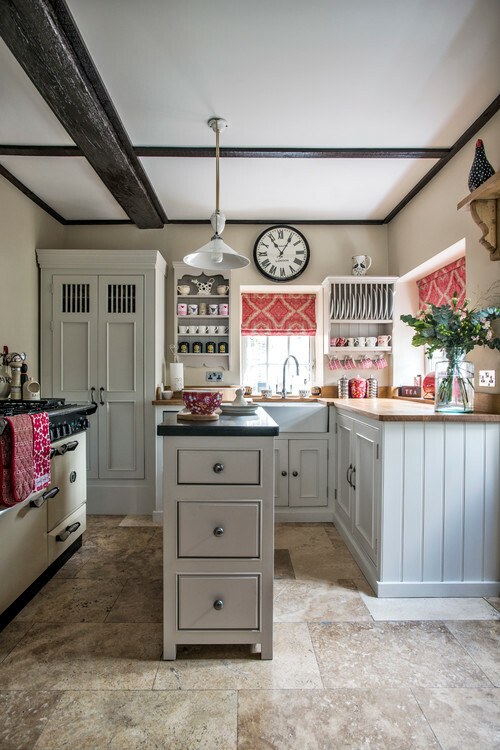 This charming cottage kitchen was designed and befitted by Middleton Bespoke, known for their quality craftsmanship. Old World charm flows throughout the functional and attractive space. Think an island won’t fit in your small kitchen? Think again! This narrow island makes great use of both form and functionality. Frequently used bowls take residence on the open shelves while drawers create handy storage for utensils and dish towels. One corner of the kitchen showcases a handsome custom cabinet. All your dishes can fit right here. A major factor when creating ease of use in a small kitchen is organization. Like items are grouped together on shelves for easy finding. A convenient plate and mug rack provides quick access to everyday dishes. 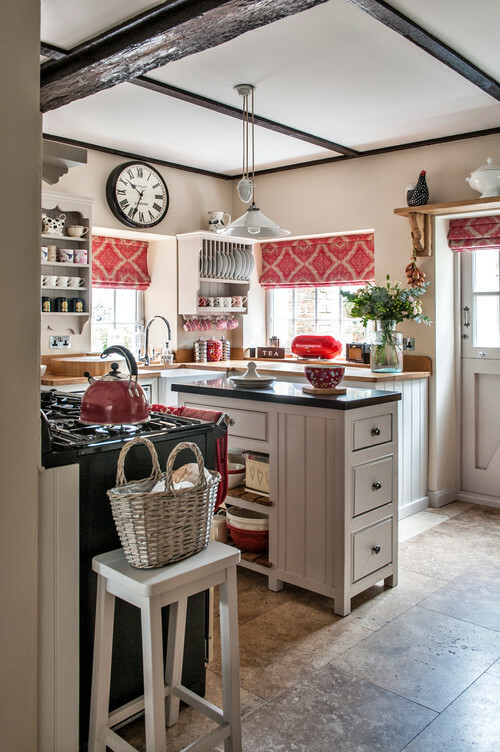 Beautiful red valances and a fresh bouquet add style to the small space kitchen. And note the bead board look on the side of the cabinets – we created this same look in our kitchen by adding bead board to the ends of stock cabinets. 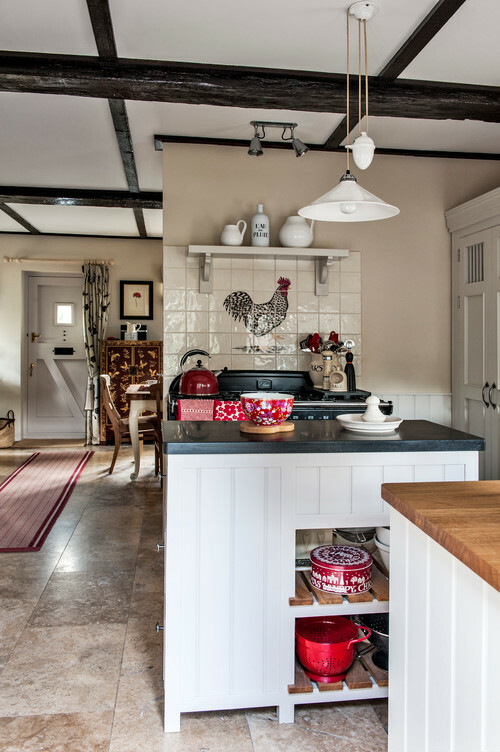 A vintage stove graces one side of the kitchen while a farmhouse rooster struts his stuff on the tile work. I’m thinking of adding a pulley pendant light like this one to my own small space kitchen. Another custom cabinet adjacent to the stove acts as a pantry for food preparation. You can see a glimpse of the dishwasher next to the pantry. 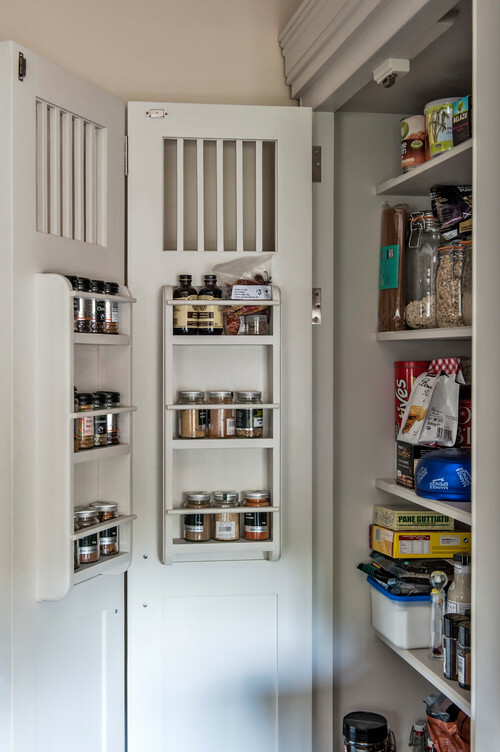 Ample storage is provided both on the shelves and with the built-in spice rack. Perfect! Wood beams add to the cottage appeal of today’s small space kitchen. I don’t think I’ve ever seen a small kitchen with such great use of space. 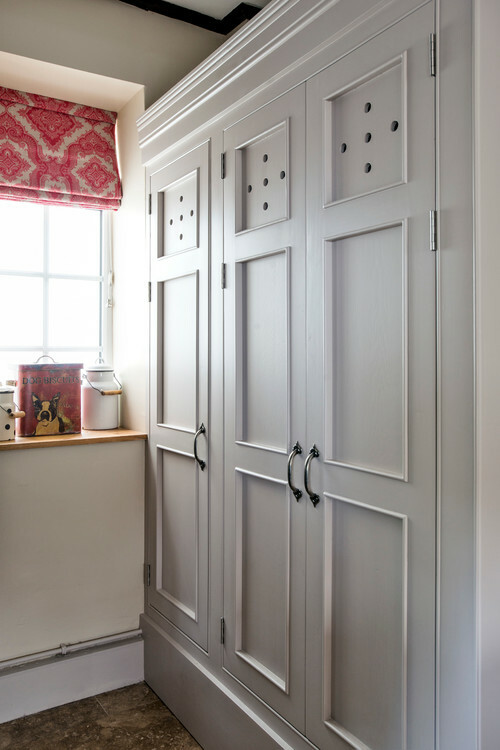 You can view more of Middleton Bespoke’s custom kitchen projects on their website at www.middleton-bespoke.co.uk. What are some challenges you face in your own kitchen? Not enough Storage? Lack of an easy work flow? For me, it’s a little of both! This is going down as a favorite. 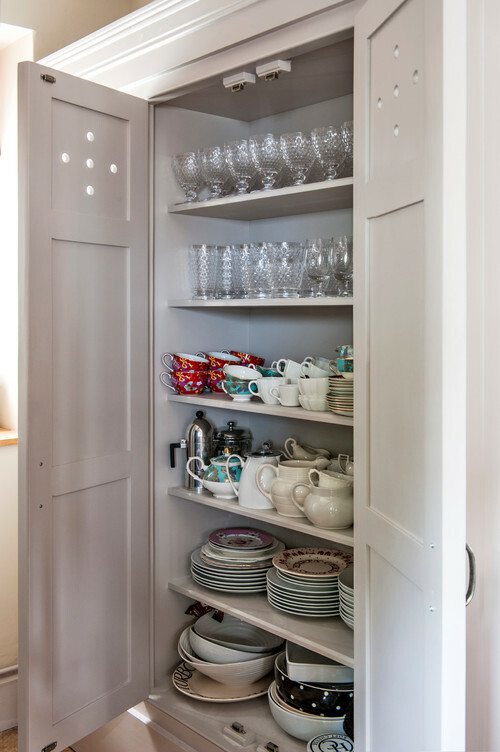 It has the look of quality freestanding cabinetry, and I like the unpredictability of it all. I have an island of about that size (48″ x 22″) in my small kitchen, and it does the job I need it to. But it’s that size so we can have 36″ walk area around it. Any less is very cramped. I have an eat in kitchen, so no room for an island. However the area for the table is a nice size, so no complaints there. I even have pretty good storage via two walls of cabinets and a double door pantry, although the stock cabinets installed by the builder have none of the convenient bells and whistles that I would love to have, such as drawers rather than doors to lower cabinets whose back portions I cannot even reach; pull out shelves; plate racks; multilevel silverware/cooking tool drawers, some open shelving for everyday use etc. As I get older (I’m 75) I find that inconvenience takes on a lot more importance than it did 20 years ago. I have pointed out to anyone I know who is either just building or remodeling to build in these conveniences. You will not be sorry. Love this kitchen! Also love the collage you put together to pin! I also love this kitchen. My own kitchen probably has about the same storage. I’ve also made use of free standing pieces like my pie safe to add storage. We are a family of six and I find the smaller space keeps me from letting clutter stack up either on counters or in cabinets. I do live close to the grocery store, and I use space in the laundry room to store rarely used items and bulk items. We also use our dining room for meals. It is a step away from the kitchen and not formal but matches the kitchen in style. There is a small 2 seat island which is also a free standing piece. 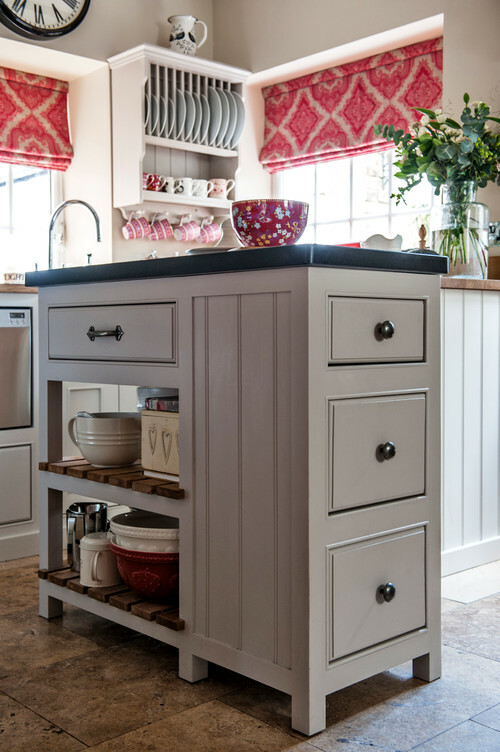 This kitchen shows that with the right organization and some discipline, a small space can be charming. The one drawback – the lack of countertop on either side of the range would make me crazy:) I love the pantry cabinet, but with the wall of pantry cabinets on the other wall, I would have opted for some counter space between the stove and sink. Very sweet!! So, where’s the refrigerator??? That is what I was wondering! Such a cute and functional kitchen. And as much as i love it, all I could think was, there are obviously no toddlers or babies in walkers around. I really didn’t think I’d have to baby proof my house again as a grandmother. But, they’re only little for a short while, so it’s fine. The joy they bring is ample compensation. I love this kitchen, wish mine were more simple like it. Wish i could rip out some of my cabinets but, no Mr., so maybe some day this old lady will just go for it.lol! This is amazing. I liked the style storage for small space kitchen. This is such a great post.